The newly appointed health minister, Earl Howe, chose to visit Moorfields Eye Hospital and the UCL Institute of Ophthalmology as one of his first official visits. During the visit, Earl Howe found out more about a range of technologies which are supported by UCL Business that are taking place at Moorfields and the institute. Health minister Earl Howe said: “It is exciting to see first hand how innovative technology will give NHS patients the very best treatments and also furthers the UK’s standing in the biomedical research industry. “Basing decisions for treatment on the latest research evidence helps NHS doctors, nurses, GPs and health professionals to provide patients with the most effective and appropriate care. 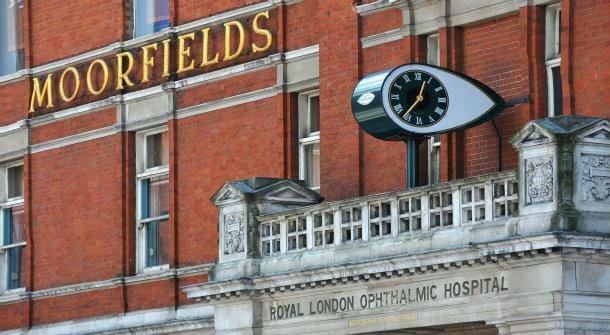 Professor Peng Khaw, Moorfields’ director of research and development said “We were delighted to have the opportunity to tell the new minister about a few of the important research initiatives going on here at Moorfields and the UCL Institute of Ophthalmology. Photograph shows health minister Earl Howe with Moorfields glaucoma patient Julia Margetts and Professor Steven Brocchini, who is working on a new anti-scarring treatment.